Commentary from faculty members on books from the 1836 library catalog are available on iTunes. 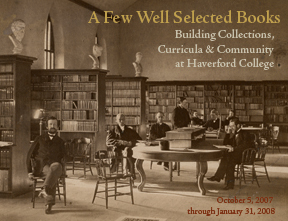 Podcasts to accompany Magill Library's current exhibition, "A Few Well-Selected Books: Building Collections, Curricula & Community at Haverford College," are available through iTunes. Deborah Roberts, Professor of Comparative Literature and Classics, and Bret Mulligan, Assistant Professor of Classics, discuss the traditional study of Greek and Roman literature and language at Haverford College. Emma Lapsansky, Professor of History and Curator of the Quaker Collection, discusses the controlled nature of the curriculum at Haverford College in the 19th Century. Darin Hayton, Assistant Professor of the History of Science, talks about the historical significance of some of the science volumes in the Haverford Library's 1836 catalog. Bruce Partridge, Professor of Astronomy, describes three different categories of materials he notices in the early Haverford Library collection: popular works, scholarly works, and textbooks. Write a review in iTunes and tell us what you think. And don't forget to stop by the Sharpless Gallery to see the exhibit for yourself! Haverford's first library catalog was a slender 40-page book printed just three years after the first students arrived in 1833. The 770 titles included in this nascent collection give clues to the kind of intellectual life the school's Quaker founders sought to encourage in these young men. In the years that followed, the collection has expanded under many other influences; faculty, alumni, community groups, other libraries, and, most especially, students have all played a role in building Haverford's collections. This exhibition tells the story of the first "few well-chosen books" and honors those who have been responsible for growing this corpus into today's wide-ranging collections.